Her candidacy shares more than a little with Donald Trump's. When coming up with strategies to combat an electorate that chose a reality TV star for America’s highest office, “voting a videogame developer into Congress” is not something that typically comes to mind. Yet, for a certain group of liberals, that is exactly the solution that they came up with. 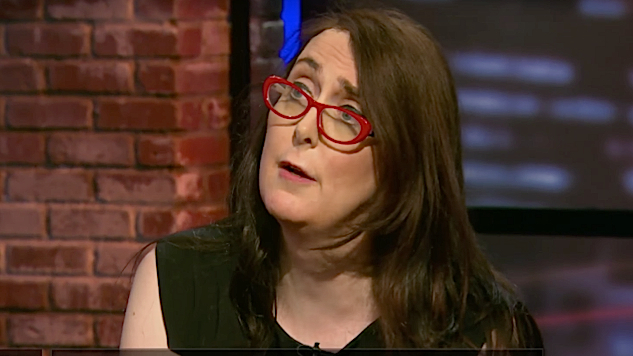 On Dec. 21, videogame developer Brianna Wu announced that she would be running for Congress in her home state of Massachusetts. Later, she clarified she would be running as a Democrat against Stephen F. Lynch, Congressman in the 8th District, in the 2018 midterms. Lynch, who is also a Democrat, has come under fire from his party for his pro-life policies, but has been a member of congress since 2001 and has defeated every candidate—including Democrat Mac D’Alessandro, Republicans Vernon Harrison and Joe Selvaggi, and Independent Phil Dunkelbarger—in his path. Aside from a brief stint in political fundraising during her younger years, Wu has no political experience. However, what she does have is the support of a large portion of feminists due to her time speaking out against online harassment. Wu first came to the public eye in 2014 during the throes of the infamous GamerGate mess, a movement that started out with an angry screed written by a spurned ex-lover and, through a series of ill-conceived events, evolved into a large-scale harassment campaign allegedly questioning the integrity of gaming journalism. Wu was a prominent target for harassment by the organization after speaking out against them. Since then, she has become a prominent figure for women’s rights in the gaming community, appearing on MSNBC, Inc. and The Guardian to speak out against GamerGate and, later, the alt-right movement that is closely associated with it. To a Democrat who opposes Lynch’s policies, Wu may seem like the ideal candidate. Her lack of political experience may be an issue, sure, but she at least represents more progressive ideas in 2017 than her opponent, right? Yet, it only takes a bit of research to see that Wu’s campaign is steeped in classism, gentrification and has a lot more in common with Donald Trump’s than she will ever admit. This is being treated as the prime hook to entice voters. One need only look at her website to see this. Emblazoned in large bold letters is the statement “She Fought the Alt-Right and Won”. What exactly constitutes “winning” against the alt-right in this scenario, however, is unclear. Considering the movement still exists, is still harassing women and one of its architects just got a comfy position in Trump’s White House, nobody can really say what exactly Wu “won” in her battle against the alt-right. She may be speaking about her personal success, considering her bevy of media appearances and large following gained after the harassment, but that will most likely be of little comfort to those who are currently facing the brunt of the organization. So the campaign is already built on a shaky foundation, but what is she actually campaigning for? Wu said although Massachusetts enjoys a stellar education system, many startups and technology companies end up moving out of state — a practice she’d like to help end. Moving aside the odd implication that the only reason people get education is to enter tech, what benefit does investing in the tech industry give to the average Boston citizen? None, unless you happen to be one of Wu’s friends who works in the tech industry. The question of what part of the budget Wu would slash to benefit her coworkers is currently unanswered, but the answer doesn’t really matter. The fact that she claims to be an advocate for women’s rights while also expressing her desire to divert funds to the (predominantly white, predominantly male) tech industry should speak to her lack of credibility as a feminist. Plus, since tech isn’t a market that’s particularly welcoming to those without expensive degrees, supporting its expansion into areas where it isn’t particularly large or needed is ultimately a pro-gentrification stance. @caulkthewagon I would say this – I was never against Bernie's ideas. And since the election I've said publically I think he would have won. @caulkthewagon He's right that the economy is rigged. He's right that we need to focus on the working class. I stand with him on that. @Brook2Jonathan No, I'm a Democrat. I just want to use our federal funds for leverage against consistently terrible choices. @kbladow So am I. But, using those taxes for leverage is a tactic we need to look at seriously. Repealing Obamacare will cost billions. According to Wu, those in conservative states, regardless of who they voted for, deserve to have their education and healthcare taken away from them as “leverage” against their public officials, who probably don't care about them to begin with. This would benefit no one, and would only hurt the working class in these states. For context, the incredibly stupid and classist post she is defending can be found here. 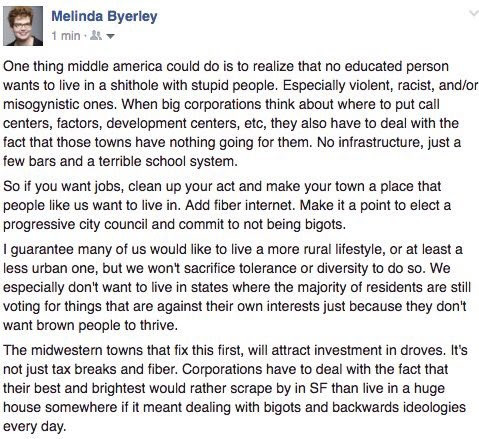 Wu’s defense of Byerley’s statement lines up with her previously expressed ideology: That everyone in conservative states is a dumb bigot. Never mind the minorities that are suffering in these states, the fact that they live there means they deserve to suffer too. The majority of Wu’s campaign has been focused on women’s rights and her self-stylings as a progressive, but when looking at her policies that don’t directly relate to women’s rights, they are virtually identical to the conservative platform she is allegedly running against: Pro-gentrification, support for big industries with only a cursory acknowledgement of smaller businesses, and deliberately taking away from underprivileged and marginalized Americans solely to spite her political enemies. Wu’s campaign confirms one of two things: She knows nothing about politics, or she’s content to use the poor as pawns. Or, to put it bluntly: She’s either an idiot or actively malicious. Both are likely, and both are equally troubling. There’s an assumption I’ve made for the majority of this article that I have yet to address. It’s the assumption that the American people would see the headline “A videogame developer with no political experience is running for Congress” and not immediately laugh it off. Yet, in an era where a buffoon famous for his reality TV appearances was elected President, it’s an assumption that I unfortunately have grounds to make. Wu isn’t just similar to Republicans in policy: her support base is infused with the same fury and lack of regard for information as Trump’s. Both are public figures with no political knowledge, but both are taken seriously because of the self-righteous fervor they inspire in their followers. And just like how Donald Trump used the working class as a way to gain power, Brianna Wu is using progressives as a way to further her own ends. I have hope that Wu will fail in her campaign. She has stated that she will be focusing her ads on social issues and the tech industry, which is a voting demographic so narrow that it’s practically non-existent. But to those considering voting for her, hear my plea: Brianna Wu is not a progressive. A vote for her is a vote for the logical endpoint of Trump’s victory: ability no longer matters. All that matters is celebrity, the amount of sanctimonious posts you can make and the amount of people who agree with them. Wu’s election would finalize the spreading of this ideology to the left as well as the right, and if that were to happen, then I feel confident in stating that America is utterly and irreparably screwed.